ed the tail of the verdant rodent by you-know-who and if you don't you should live so long! He had a thumbnail description of it, thus: "Machine to find affinity." By ghum, that sounded like fantasy--if not stf--to me. Stuck again: When Charlie Dye called, he cried, "Oh, no! Why Forry, what's this book doing here? It isn't fantasy!" "No Affinity Machine?" I croaked; "no mermaid?" 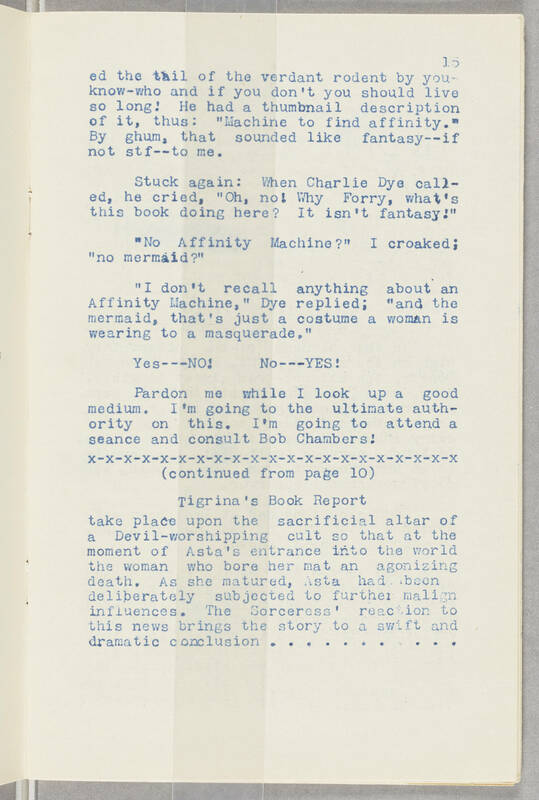 "I don't recall anything about an Affinity Machine," Dye replied; "and the mermaid, that's just a costume a woman is wearing to a masquerade." Yes---NO! No---YES! Pardon me while I look up a good medium. I'm going to the ultimate authority on this. I'm going to attend a seance and consult Bob Chambers! (continued from page 10) Tigrina's Book Report take place upon the sacrificial altar of a Devil-worshipping cult so that at the moment of Asta's entrance into the world the woman who bore her mat an agonizing death. As she matured, Asta had been deliberately subjected to further malign influences. The Sorceress' reaction to this news brings the story to a swift and dramatic conclusion. . . . . . . . . . .